We’ve all seen the Instagram and Facebook photos captioned “living my best life,” but what the heck does that even mean? An overly filtered photo of a perfectly posed individual (who swears it’s candid) or a swoon-worthy Insta-story capturing every angle of the best brunch you’ve ever seen can be a little misleading. In an age where social media sets high expectations for what happiness looks like, it can be easy to lose sight of where it all begins. We believe that living your best life starts within and thrives by nurturing every aspect of your mind, body, and soul. To support your self-love mission, we’ve gathered a few easy ways to maintain a positive body image and be your happiest, healthiest self. It’s natural to try a few—or maybe a whole bunch of—workouts before you find a fitness routine that really sticks. If you’re not comfortable heading to a new class on your own, grab a friend to check it out with you! If it keeps you coming back for more, you’ve definitely found a keeper. It’s an incredible feeling when you actually look forward to your workout instead of dreading it. Take the time each day, or even a couple of times a week, to recognize and jot down all of the amazing qualities that you have, things that you’re proud of, or a goal you met that day. Remind yourself how much you love and respect your body. Even if you have a bad day here and there, journaling can serve as a great reminder when you’ve overcome any difficulties and provides the perfect opportunity to reflect on how strong of an individual you are (#grlpwr). Sure, we’re here to remind you it’s important to put healthy nutrients into your body. But, we’re also here to tell you that enjoying pizza or your favorite ice cream flavor once in a while is totally fine, too. It’s all about balance. Trying every single new diet craze isn’t necessarily the healthiest choice. Instead, find what works for your body and makes you feel energized and ready to take on the day. Don’t stress—your goals don’t have to be anything outrageous. They can be as simple as committing to walking around the block every day or grocery shopping more frequently instead of eating out all the time. Once you get into a routine, you can set loftier goals that stretch you more and more to ensure you’re always growing. It’s totally acceptable to make your well-being your #1 priority. Focusing on what your body needs is extremely important. If you need a weekend to yourself instead of filled to the brim with plans, do it. You’re allowed to give yourself a time-out, no guilt involved! While you’re at it, take a moment to meditate. It can be as little as one minute, but thinking about nothing besides the inhale and exhale of your breath can provide a much-needed reset. Choosing what to wear for the day can be a little overwhelming, especially if your wardrobe is cluttered. 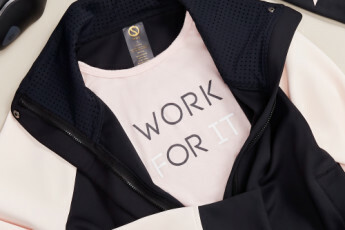 Start by cleaning out your closet and in the words of the great Marie Kondo, get rid of anything that doesn’t “spark joy.” Whether you’re heading to a workout or getting ready for the weekend, let your heart decide what to wear instead of your head. If an item makes your heart skip a beat or brings a smile to your face, go ahead and wrap yourself in that little piece of happiness. Your positive energy is sure to radiate off of you and be contagious to others. If there are any source frustration or insecurity in your life that constantly get you down, it’s time to say buh-bye. Whether it’s an individual, Instagram account, or television show, there’s no reason to surround yourself with anything that makes you feel less than your absolute best. Replace those sources of negativity with positive influences that share the same values as you and reinforce a healthy and happy body image.